The Daily Toad: Proudly disseminating sensationalised rubbish since 1645. 26th Feb 2008. 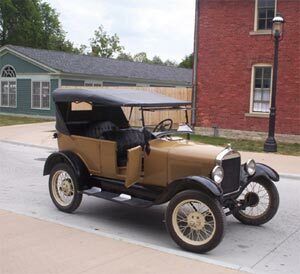 The model T Ford epicyclic gearbox, long renowned for its simplicity, strength and ease of use, was standard on all Ts between 1908 and 1927. But up until a week ago, no-one knew quite how it worked, or why. "It's just one of those mysteries of early automotive design," explained Professor Edsel of the Minnesota Institute of Technology, "we all know that it works, but no-one could explain how." 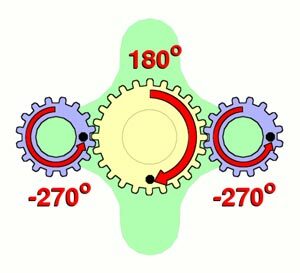 The planetary system of gears with their constantly meshing collection of planet, sun, and an inwardly toothed annular gear had been used for many years on other applications, but it was Henry Ford who really brought it to the zenith of unexplained technology with the ubiquitous model T. The big mystery is how a gearbox of less than five moving parts can manage not only two forward speeds, but also a reverse. "Our colleagues had been working on the problem in the fifties," explained Professor Edsel, "and after eight year's work they had managed to figure out how you can get two forward speeds. But the reverse thing really flummoxed them, and they gave up." But now, after sixteen years, the mysteries of Henry Ford's gearbox has finally been unveiled, and Edsel explained his findings to a packed symposium of automotive engineers, who had him go over it twice, just to make sure they got it. "The uses for this new rediscovered knowledge is already bearing fruit on numerous applications," explained Professor Edsel, "next week we're going to start work on trying to figure out just how we managed to get to the moon with 1960's technology. Believe me, we've got no idea how we managed that."